Can the once stellar QB rebuild his career with the NFL’s blackest organization? Oct. 25, 2015. The final seconds tick down for a Washington Redskins 31-30 victory over the Tampa Bay Buccaneers. The Skins had overcome a 24-point first-half deficit — the biggest comeback in franchise history — and it was time for one of the longest postgame celebrations in recent memory at FedEx Field. Coaches hug team executives. Players hug trainers. Fans hug anyone they can find. 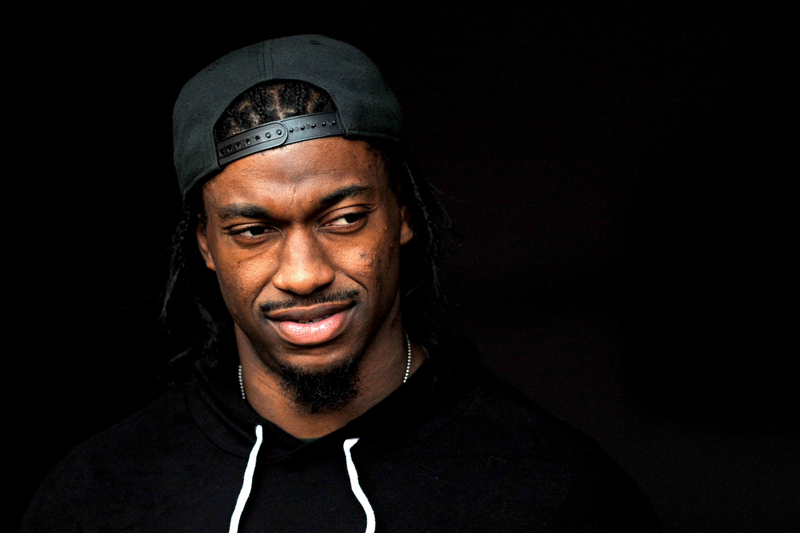 Only Robert Griffin III stands alone. Just three years ago, the quarterback would have been at the center of the exhilaration. Despite being injury-free, Griffin had spent his time in this game as he had during all of the games last fall: standing along the sideline or seated on the bench in Redskins’ workout gear without even a clipboard to shield his irrelevancy. He smiles sheepishly, high-fives a few players who rush past him but mostly he just watches the fun alone. This is Kirk Cousins’ day, the backup who now has Griffin’s job. The Redskins are Cousins’ team now. The once unthinkable is ineluctable. After one of the most spectacular rookie seasons in NFL history, Griffin is on his way out. Less than four months later, he will be released. The Cleveland Browns are just going through the motions — it’s still April — but the team’s newest quarterback is attacking his drills like a drowning man determined to stay afloat. 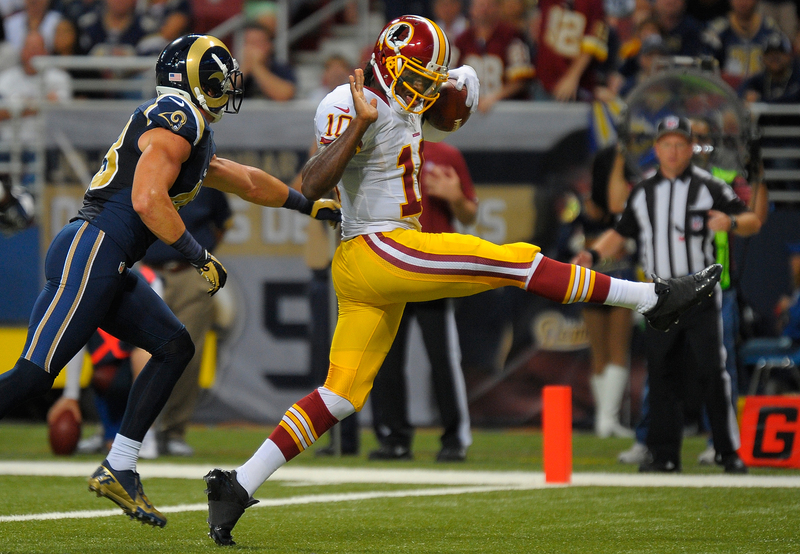 As he drops back, Robert Griffin III has never displayed better footwork. Over and over again, he sets the correct depth on his drive step. He’s equally precise on his crossover and balance steps. From a textbook throwing position, Griffin squares his shoulders correctly toward his targets and whips the ball around the practice field, hitting receivers in stride. Comeback routes, out routes, dig routes — Griffin hasn’t thrown the ball this well in practice in years. His teammates are impressed. After several strong throws, many are smiling. Maybe the Browns have found the quarterback they’ve needed for so long. Once again, Griffin is in a place where he’s wanted. A stunning fall from the highest heights of the NFL has left Griffin scrambling to rebuild a career that began like the opening act of a blockbuster. You have to remember: Back in 2012, Griffin had the greatest season statistically for a rookie quarterback in NFL history. He set NFL rookie records for passer rating (and for percentage of passes intercepted). Griffin accounted for 27 touchdowns and led the league in yards-per attempt. As a runner, he topped the NFL in yards per carry. He also led Washington to its first division title in 13 years. And if there was a better corporate pitchman that year, we never saw him. Griffin wasn’t merely an exciting player. He was the total package. He was RG3 — the Next Big Thing. Griffin also provided hope where none should have existed. Only four weeks into his NFL career, Griffin rallied the Redskins to a road victory over the Tampa Bay Buccaneers. With 1:42 remaining in the fourth quarter, Griffin completed three consecutive passes to move the Redskins from their 20-yard line to the Buccaneers’ 41, and then darted 15 yards to the 26. Two plays later, the Redskins kicked a field goal. Final score: Washington 24, Tampa Bay 22. Griffin completed almost 75 percent of his passes for 323 yards in a turnover-free performance. He was only warming up. In Week 6, Griffin delivered a 138-yard, two-touchdown rushing performance — his 76-yard run was as good as any highlight reel will ever showcase — to lead the Redskins to a 38-26 victory over the Minnesota Vikings. One week later, trailing the New York Giants, 20-16, with only 2:07 to play, the Redskins faced fourth and 10 from their 25-yard line. Both Jason Pierre-Paul and Osi Umenyiora appeared to have Griffin teed up for potential victory-clinching sacks. Then in a scene you’d only expect to see in a cartoon, Griffin made a couple of ridiculous juke moves, the two star defensive linemen flew past him and he completed a 19-yard pass to extend the drive. The Giants blitzed on the next play, and Griffin ripped off a 24-yard run. Finally, Griffin capped the drive with a 30-yard, go-ahead touchdown pass. He also gained 89 yards on only nine rushes. 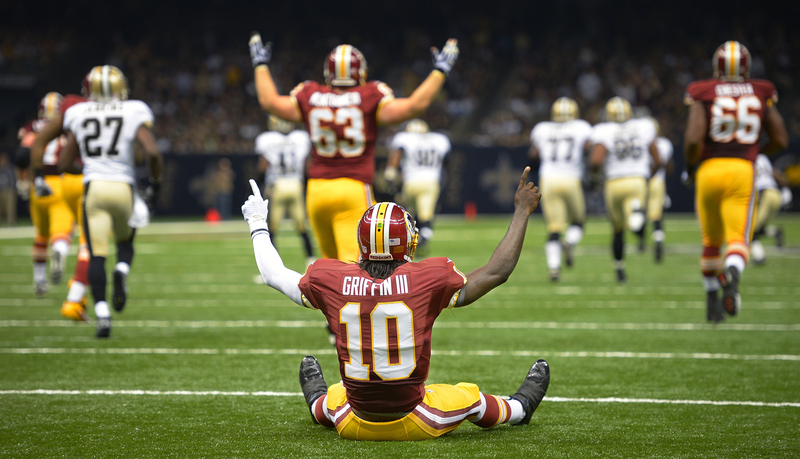 The Redskins still wound up losing, but you get the point: Griffin was fabulous. Talk to people who worked with Griffin in Washington, and most will tell you he had chances — too many — to salvage his starting position and that many of his problems started with him. Griffin was too focused on his endorsements. He overindulged in social media. He alienated teammates by deflecting blame for his poor performances and ran his mouth too much in interviews. He should have spent more time in the film room and less on enhancing the cult of RG3. The truth is Griffin, who declined to participate in this story, was oblivious to the crumbling of his career and has never accepted responsibility for his role in his failure. But the African-American pioneers at his position did recognize what was happening. They saw a young, talented brother going under and tried to help. Griffin, however, didn’t think he needed saving. Now, at only 26, the former star is back to auditioning to stay in the game. Nov. 22, 2012 — The party was in full swing before the wheels went up on the flight from Dallas to Northern Virginia. After a 38-31 victory over the Cowboys on Thanksgiving, the Redskins kept the good times going until well into the next morning. As laughter roared through the plane’s cabin, everyone on board understood who was most responsible for the fun: Griffin. In his first NFL game in Texas, the Heisman Trophy winner from Baylor, located about 100 miles south in Waco, dazzled. Griffin passed for four touchdowns and 304 yards. He directed four touchdowns drives in a 28-0 second quarter. Two of his three scoring passes in the quarter covered 68 and 59 yards, respectively. Griffin was so cool. In the fourth quarter, after Dallas pulled to within seven points, the rookie calmly led a clock-killing drive capped by a field goal. From start to finish, it was all about Griffin. “In all my years in the league, that was as happy a plane ride as I can recall,” said former inside linebacker London Fletcher, a 16-year NFL veteran who spent his last seven seasons with the Redskins. Griffin was part of a celebrated rookie quarterback class that also included Indianapolis’ Andrew Luck and Seattle’s Russell Wilson. Luck and Wilson had great seasons. Griffin’s was better; he has the 2012 NFL offensive rookie-of-the-year award to prove it. Outside the Beltway, Griffin also had a large following. At one point, he was wearing the league’s top-selling jersey. Whenever he sent out a tweet, he sent Twitter abuzz. You couldn’t turn on a television without seeing Griffin hawking top brands. Adidas, EA Sports, Gatorade, Nissan, Subway — companies raced to partner with him. Adidas created both a personal logo and signature-training shoe for him. Griffin’s knack for making big plays with big style resonated with fans. Former Washington head coach Mike Shanahan and his son, Kyle, the team’s offensive coordinator at the time, constructed a college option-style system similar to Baylor’s offense. Early in his first season, there just wasn’t much film on the Redskins’ radical new offense. Throughout training camp and the preseason, the Shanahans kept everything under wraps. For a quarterback, Griffin is stunningly fast. He has been clocked at 4.41 in the 40-yard dash, which is the type of time teams hope to see from wide receivers and cornerbacks. On “off-schedule” plays, which occur when things go awry in pass protection, receivers run wrong routes or a combination of both, Griffin usually gained yards in chunks. Even in third-and-long situations, Washington’s opponents would remain in basic alignments to attempt to stop the run first. That was unheard of. Call it the Griffin Effect. In his debut, Griffin was knocked down while completing a long touchdown pass. Seated on the field, he raised both arms in celebration. “Griffining” went viral on social media. Madison Avenue notices such trends. But let’s call it like it is: Besides Griffin’s big performances, a big part of his appeal was that white people considered him to be “safe.” Raised in a military household by two now-retired Army sergeants, Griffin was reserved. On the field, he wasn’t prone to look-at-me celebrations. Off it, he didn’t seem standoffish. Basically, he wasn’t Cam Newton. March 2012 — Redskins majority owner Daniel Snyder and his partners celebrated aboard his yacht in the Bahamas. They had just made one of the biggest trades in NFL draft history — four high-round picks — three in the first round and one in the second — to the St. Louis Rams for the second overall pick in the upcoming draft. Mike Shanahan was a huge fan of Luck, the Stanford standout. The Colts held the No. 1 pick and were all in on Luck, widely considered the best prospect at the position since Hall of Famer John Elway. That was fine with Snyder, who had locked in on Griffin. To make sure the Redskins got Griffin, Snyder agreed to pay a high premium to acquire a top-two pick. Although Snyder amassed a fortune in advertising and marketing, it didn’t take a sales genius to see the benefits of a Redskins-Griffin union. Though the city’s African-American population fell just below 50 percent in 2010, there is still a substantial African-American fan base. That’s why Washington is nicknamed “Chocolate City.” (It’s also the hit title track of Parliament’s 1975 album of the same name, which was a tribute to the city.) Drafting a dynamic African-American quarterback seemed like a sound business move. Looking back on it with what we know now, however, Snyder and Griffin weren’t necessarily seeking the same thing. Correctly, Snyder imagined the possibilities with Griffin. He got a glimpse of how well Washington’s African-American fans responded to Donovan McNabb during the Pro Bowler’s brief run with the team in 2010. Even though McNabb was at the end of his career, his presence in D.C. helped to keep cash registers open wherever team merchandise was sold. Griffin marked a new beginning for African-American fans. They could watch him grow. He was theirs. But for Griffin, race is only a small part of his self-identity. He says his parents raised him not to look at race and growing up, it wasn’t something he thought much about. Playing in a predominantly African-American city wasn’t a big deal for Griffin. He just wanted to realize his NFL dream somewhere. Griffin would have been just as comfortable if he wound up in Indianapolis and Luck landed in D.C. But while Snyder and the team’s minority owners basked in their accomplishment during the impromptu trip to the Bahamas, Coach Shanahan wasn’t having fun. “Dan knew I wasn’t very happy about what we did, but he wanted everybody to celebrate how smart we were, so we jumped on his plane and met the other owners on his yacht,” Mike Shanahan recalled. “Everyone was celebrating. I just didn’t think it was very smart to give up that much for a guy who we didn’t even know if he could drop back and throw. Mike Shanahan had a point. Unlike Luck, who mostly played under center in a pro-style system in college, Griffin worked in a spread offense — a shotgun approach that is less taxing on a quarterback than a traditional NFL offense. Luck was considered to be far more NFL-ready than Griffin. Many NFL coaches have bemoaned the fact that college spread quarterbacks enter the league ill-prepared to handle the complexities of the pro game, especially at making pre- and post-snap reads and adjustments. Within Griffin’s first few weeks of practice, “you could see you couldn’t expect him to come in and drop back,” Mike Shanahan said. “Robert is very smart. It had nothing to do with that. But he had never done this before.” It showed. Immediately, coaches noticed major flaws in Griffin’s passing mechanics. There’s a beat to the three-, five-, and seven-step drop, and Griffin didn’t have it. If a right-handed quarterback is throwing to his right, he must close down his left shoulder so it’s in line with the midpoint of his target. Too often, Griffin’s shoulder was wide open. On passes to the left, which require more detailed footwork for right-handers, Griffin was repeatedly out of rhythm. Although Griffin had top-notch arm strength, his tempo was off. That’s a problem because if a quarterback isn’t in sync with the rest of the offense, the play is over before it starts. The other problem was Griffin’s lack of pocket presence. No offensive line is perfect. Quarterbacks must understand what’s occurring around them, play within the protection scheme and, when necessary, adjust. Griffin freelanced too much in the pocket. Offensive linemen grew frustrated with Griffin; they never knew where he would wind up. Griffin also held the ball too long, which resulted in sacks that shouldn’t have happened. But none of that mattered. The Redskins had mortgaged their future to get Griffin. He had to start. “We had to do some different things,” Shanahan said. “We had to make it work.” They added the 50 series: zone-read plays that were designed quarterback runs from a spread option formation that included a lead blocker. On 50-series plays, Griffin had to decide whether the unblocked defender would follow the running back or keep to his side of the field. If the defender pursued the back, Griffin pulled back the ball and ran. If the defender stayed home, Griffin handed off. Opponents’ fear of Griffin’s running ability made the plays successful: The Redskins led the NFL in rushing and tied for first in yards per play. The 50-series also made things much easier for Griffin in the passing game. Opponents were so concerned about Griffin that their linebackers and safeties regularly played closer to the line than they did against other teams. Defensive coordinators were uncomfortable committing extra players in coverage because they had to contain on Griffin. At times, Griffin and the team’s wideouts played catch unfettered. Yet in 2012 the Redskins were a 3-6 mess by their bye week. Although capable of highlight-worthy plays at any moment, Griffin was inconsistent. 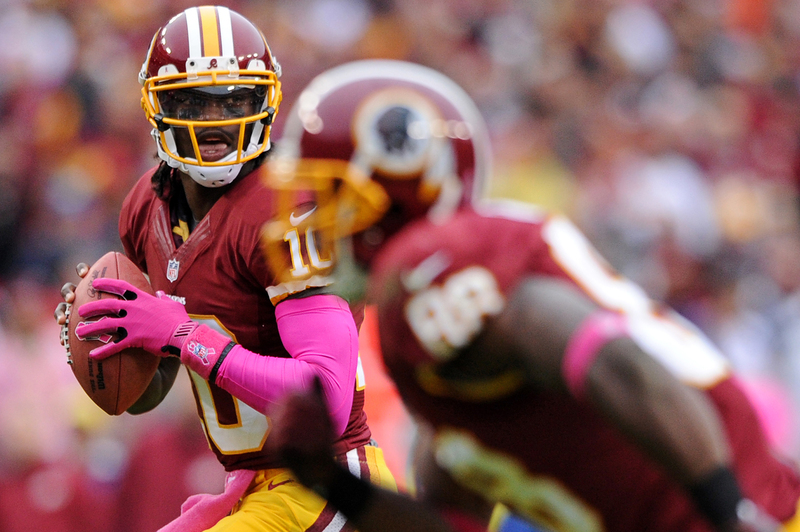 Through nine games in 2012, the Redskins were last in the league in third-down efficiency. Griffin had to play faster, Kyle Shanahan kept telling him. Griffin took too long to make decisions. It didn’t help that by Week 9, opposing teams had a ton of film on Griffin. Any defensive coordinator worth his salt should have identified something to attack. Many did. On third down, Griffin was particularly off his game. As defenses put their best pass rushers on the field in multiple blitz packages, the game speeds up considerably. Griffin definitely didn’t respond well. He wasn’t cycling through his progressions fast enough. So the Redskins pared down the offense. Kyle Shanahan told Griffin to only read one side of the field. If two receivers were covered, Griffin was instructed to run. Effectively, Griffin’s legs became the last resort, or the check down, in the Redskins’ offense. The Redskins closed the regular season on a seven-game winning streak and reached the playoffs. After so many misfires, it seemed the Redskins were finally ready to take off. But cycling progressions weren’t RG3’s only problem. Griffin struggled to protect himself. To the coaching staff’s surprise, he had never learned to execute the quarterback slide, and he was opposed to throwing the ball away. Those were big problems for a quarterback who was most effective on the move. For the coaching staff, Griffin didn’t need to gain 20 yards on every 50-series run. It was all about keeping the linebackers and safeties guessing. A five-yard gain was fine. Maybe the next play would be a big one. Much faster than his competition in high school and college, Griffin never took the time to perfect the quarterback slide, and, apparently, none of his coaches cracked down on him about it. The whole thing about holding onto the ball was tied to Griffin’s ego. He explained he didn’t believe in giving up on plays, and he had confidence he could always come through for the Redskins as he did for Baylor. Well, that’s nice in theory, but Griffin didn’t face NFL-caliber defensive linemen and linebackers on every play against Kansas. Griffin’s wrongheaded thinking about taking unnecessary risks would result in a stunning change of direction for Washington. Late in the season, Griffin, who’d had reconstructive surgery on his right knee in college, injured his knee against the Baltimore Ravens. Based on Griffin’s medical history, he shouldn’t have returned to the game after colliding with Ravens defensive lineman Haloti Ngata. But back in he went and, clearly hobbled, played four more downs before being removed for Cousins. Shanahan and former Redskins assistants insist Shanahan was told by a high-ranking member of the medical staff that Griffin was fit to play. Griffin sat out the next week and Cousins starred in a streak-extending road win over Cleveland. Cousins completed more than 70 percent of his passes for 329 yards and two touchdowns. Throughout, Cousins was in command of the huddle and the pocket. On a play-action bootleg in the first quarter, Cousins rolled to his right and delivered a perfect deep ball for a 54-yard touchdown. The drumbeat of the offense was different from what it had been with Griffin. After the game, it was apparent that Griffin wasn’t as upbeat as usual. It’s not uncommon for injured players to be frustrated. With Griffin, something else was going on. The designed quarterback running plays that had become a staple of the offense were mostly missing from the Cousins game plan (the backup had only one designed run). Griffin was furious that Cousins was not asked to assume the same risks that the Shanahans seemed so comfortable making him take. The chasm between the young star and Washington’s father-son coaching tandem would only worsen. Just a short walk from the locker room is Doug Williams’ office at Redskins Park. His door is always open, and some players stop by often to receive the former quarterback’s counsel. During his time in Washington, Griffin wasn’t among them. As the first African-American quarterback to win a Super Bowl, Williams occupies a special place in our culture. No position more than NFL quarterback better illustrated the institutionalized racism of professional sports. African-Americans supposedly lacked the intelligence, leadership skills and toughness to thrive at the highest level in the most important job on the field. In one MVP-winning performance, Williams took a sledgehammer to that racist myth. For many, his transcendent accomplishment ranks just below Jackie Robinson breaking Major League Baseball’s color barrier in 1947. “Black folk still look at Doug Williams as a [hero] for what he did in the Super Bowl,” commentator and author Roland Martin said. Griffin worked in the same building with arguably the greatest human resource available to a young, black quarterback and squandered it. Williams believes he has a responsibility to mentor African-American players — especially quarterbacks. And Williams has been an outstanding mentor. “He had already been where I wanted to go,” said former passer Jason Campbell, who retired in 2014 after a 10-year career. “He’s a guy who had been through a lot of different things in this league. Williams and others would have done the same for Griffin. Williams is the dean of a close-knit group of retired African-American quarterbacks that includes Moon, Randall Cunningham and McNabb. Moon serves as an adviser to Newton, and he has an unofficial role as a sounding board for Wilson. Moon’s positive influence on both stars is reflected in their development as elite passers. Moon and McNabb also tried to help Griffin. Moon advised Griffin to limit outside distractions, be more guarded during interviews and work harder on the mental part of his craft. McNabb had hoped to warn Griffin to keep his guard up. However, after multiple attempts to contact Griffin failed, McNabb figured Griffin had no interest in what he had to offer. Griffin ignored a lot of advice. And why not? He was a revered three-sport hotshot in high school in Copperas Cove, Texas. 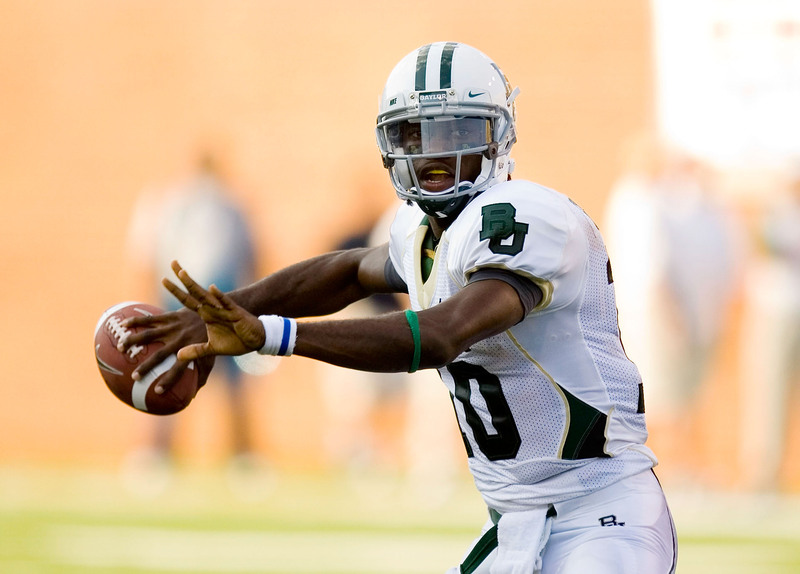 As the greatest football player in Baylor’s history, Griffin was idolized on campus. During his remarkable rookie season in D.C., Griffin was adored by fans. He had no reason to change. Griffin’s popularity even prompted some to suggest he was a postracial superstar. The whole postracial concept was laughable then and even more so now, but this was a time before the death of New York resident Eric Garner at the hands of police, and the Ferguson, Mo., unrest, the police shooting of 12-year-old Tamir Rice, and the Black Lives Matter movement, and, well, Griffin disliked being defined by race. “Jack Johnson felt this way about himself. O.J. Simpson felt this way about himself: ‘Yeah, OK, I’m black. But I’m Robert,’ ” ESPN analyst Bomani Jones said. “You grow up around enough white people who treat you well, and those are the ones who know you. It all changes when you get around the ones who don’t [know you]. … He never got that this isn’t Copperas Cove and this isn’t Baylor. This is the world. In Griffin’s final three seasons in D.C., it did all fall apart. Mike Shanahan’s replacement Jay Gruden realized quickly that Griffin couldn’t play in the pocket. After each practice during his first training camp as Washington’s coach, Gruden corrected the inordinate amount of mistakes (incorrect reads, holding the ball too long, poor pocket presence, etc.) that Griffin made on most of his passes. Finally, a frustrated Gruden turned to Cousins. Gruden’s support of Cousins infuriated many African-American fans. They couldn’t understand why the new coach — who was hired with a mandate to fix Griffin — would distance himself from Griffin after everything he had done as a rookie. On sports-talk radio shows and Internet message boards, the Redskins were roundly accused of racism. 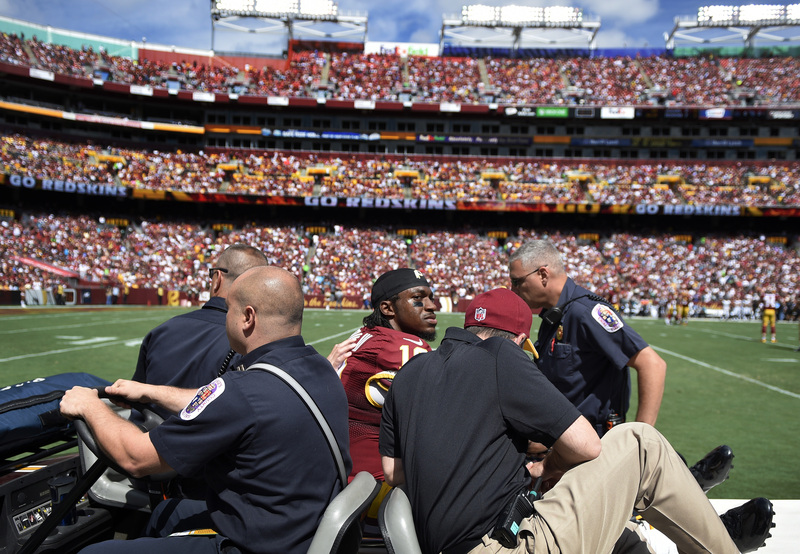 The Redskins’ quarterback controversy was shaped partly as a black-white issue. In the locker room, there was no controversy: Privately, players said Cousins was better. Anyone who watched practice regularly would have reached no other conclusion. But considering the history of black quarterbacks, though, the anger felt by African-American fans was easy to understand. For many African-American fans, management wasn’t messing with their favorite player; they were messing with one of them. Griffin’s ascent symbolized so much about the continued struggle to work on a level playing field. His fall was viewed through the same lens as the ongoing effort to delegitimize Barack Obama’s presidency, aggressive policing tactics and the nation’s increasingly hostile racial climate. “We continue to have an issue with race in American society, and that is going to pervade anything where there is the slightest bit of cross-cultural contentiousness or controversy,” said Edwards, a professor emeritus at the University of California, Berkeley. “When you get into a situation like Washington, where you have a black-white quarterback issue, as well as a quarterback issue, the issue of the black quarterback becomes a factor in that. As a rookie, Griffin caused a stir when he said he didn’t see himself as a black quarterback. In an interview with the Washington Post in October 2012, Griffin said: “My parents raised me to not ever look at race or color, so it doesn’t have a big part in my self-identity. [But] I think it has played a big part in how other people view me, just going back to when I was a kid, to even now, doing the things that I’ve been able to do. As an African American, I think other people view that in a different way than I do.” In trying to distance himself from the racism associated with being a “black quarterback,” Griffin left too much open to interpretation, which angered some retired African-American players. Many thought Griffin viewed himself as being better than them. “I go back to Marlon Briscoe at the Denver Broncos. I go back to James Harris and the L.A. Rams. I go back to Joe Gilliam at the Pittsburgh Steelers. There are so many black quarterbacks that paved the road that he’s tripping down,” Edwards said. “I understand perhaps what he was trying to say … but there’s a way that you say that. The irony of Griffin’s new situation can take your breath away again: He’s now part of the blackest football operation in the game’s history, and he’s relying on an African-American coach to jump-start his career. Besides new coach Hue Jackson, the Browns have African-Americans occupying the general manager position and both offensive and defensive coordinator jobs. Jackson will give Griffin every chance to make it back. He has been a huge supporter, and African-Americans throughout the league say that Griffin couldn’t have wound up with a better coach. If Jackson does get Griffin turned around, he will have succeeded where two other head coaches failed. Coaches are highly competitive, so don’t think for a second that Jackson wouldn’t love to accomplish something that the Super Bowl-winning Shanahan and Gruden, Jackson’s superior when they were on Marvin Lewis’ staff in Cincinnati, believe is impossible. To make it happen though, Jackson and Griffin will have to overcome a lot. Griffin hopes to become the Browns’ 25th starting signal-caller since 1999 — and only the second during that span to produce a winning record. Cleveland has missed the playoffs the past 13 seasons. Hired in January, Jackson becomes the Browns’ eighth head coach since 2003. And with three major front-office makeovers since 2013, the Browns have been in a perpetual rebuild. Once the competition ramps up in training camp, though, Jackson will soon learn that Griffin lacks the pocket presence necessary to protect himself. Think about it: Despite having the full support of the team owner, the No. 2 overall pick in the 2012 draft failed under two head coaches and didn’t appear in a game last year despite being healthy. If Griffin could have still done the job, that wouldn’t have happened. Of course, if Griffin’s second act somehow were a hit, the Browns would finally have a quarterback around whom to build. But whether Griffin can find his way back will largely depend on what he learned from his long fall, both as a football player and a black man. Everyone has to be comfortable in his own skin and do what works for them. It’s up to him to discover a new way of doing things, and maybe that means finally accepting a helping hand when it’s offered.